Your handwriting is so pretty. It looks like a computer font! Is that your handwriting? It’s so, so pretty. I agree with Shari that it looks very much like a computer font. Is that your real handwriting? It’s so … legible. I have dozens of journals that I hand wrote (back before I ever owned a computer) over the years, but now I type everything-even journal entries. I don’t miss the permanent callous I had on my middle finger from holding a pen so often. 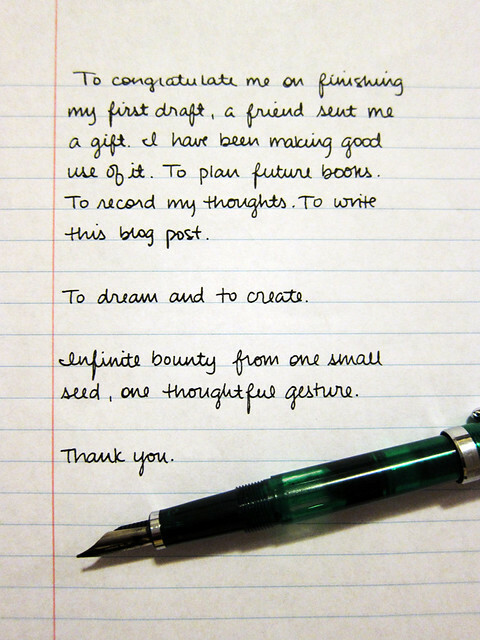 But there is something so wonderful and refreshing about reading a handwritten blog post! Thank you! Holy crap, is that your handwriting? Really lovely handwriting. I think hand writing in cursive is a lost art. No one seems to care how it looks anymore. I still do though. BTW, may I borrow the idea? You have the nicest handwriting in the world! And what a great gift! I handwrite all my drafts first…it keeps me away from the dangerous Internet! :) Congrats again! You know, I’ve been considering that more and more… I also self-edit a bit less when I write by hand, which would lend itself to the drafting process.